Give your room a touch of beauty with the Industrial Floor Lamp. It is crafted out of sturdy material that enhances its durability. This lamp has a rustic base that gives it a modern appeal. 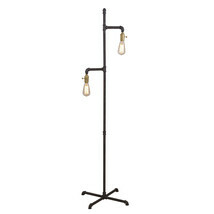 With two armed steam punks, this floor lamp accommodates two fluorescent bulbs that are not included. These bulbs are exposed with simple yet elegant design. It works with on and off switch that makes it easy to use. The bulbs have downward light direction that gives perfect brightness in the area.